Is there a solution to the time and budget problems that have yet to be fixed? We believe the answer lies in offsite construction for the reasons of sustainability, faster builds, inexpensive solutions and just as inspiring final creations. and assembly of building elements at a location other than their final installed location. Building elements may be prefabricated at a different location and transported to the site or prefabricated on the construction site and then transported to their final location. This allows for the rapid and efficient construction of a permanent structure. Different ways in which offsite construction can be executed are through prefabrication, modularization, preassembly or offsite multi-trade fabrication. Why should the U.S. move towards Offsite Construction? Below conveys the most important differences between offsite construction and traditional, or onsite construction. First, we need to look at the main characteristics that make traditional construction just that – traditional. These three elements are called the peculiarities of construction, a unique and individual description apart from other types of production methods and industries. Modular, or offsite construction, negates the issues traditional construction has with it. The structures are designed and produced offsite. This means site preparations are happening at the same time as the structures are being produced which ultimately saves time. By having objects made in an offsite, controlled environment there is very little cause for delays. The second element that makes up traditional construction, “unique every time,” does not necessarily mean that the unique attribute of constructed buildings is lost. Modular structures can be customized to the nth degree! Finally, though there is nothing wrong with temporary teams coming together to complete a project, regular teams that work together consistently know how to complete a project best, because they’ve worked with each other before and can anticipate the needed schedule based on what they already know of each other. In the article Offsite and Modular Construction Explained another difference between offsite and traditional construction is explained. Practicality is at play in the building process between traditional construction and modular offsite construction with the inside-out approach. Traditional construction starts from the outside of a structure and then moves in to finish inside jobs like interior surface, electrical, plumbing, mechanical, insulation, exterior sheathing, and cladding. With a modular structure, the frame is fitted together to form the infamous rectangle/box shape, and then the inside jobs are completed before the outside paneling is applied. Here’s a picture of a modular being built; the steel frame is up and the interior hardware is applied before any outside paneling closes the structure in. trades waiting on one another, and incessant delays associated with on-site construction. Not only does modular offsite construction have a different method of assembly, it also conserves more when it comes to the waste that accumulates during the process of traditional construction. Offsite construction generates up to 90% LESS waste than traditional onsite construction building methods. Why Are Only 46% of Capital Projects using Offsite Construction Methods? 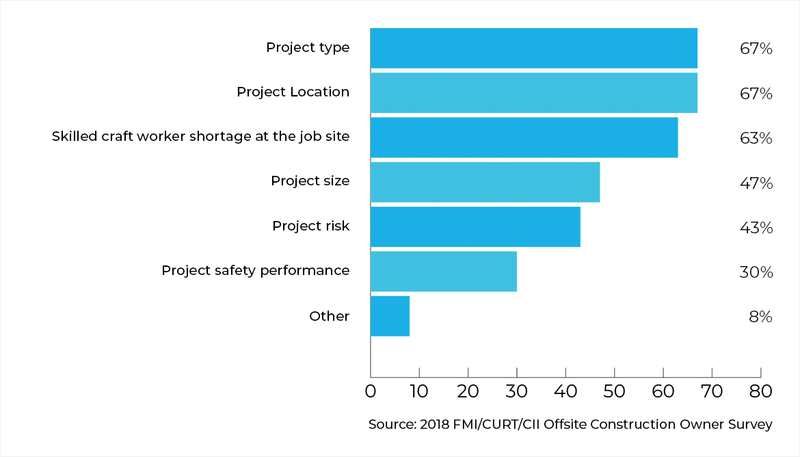 Besides the above statement, there are two main areas that have added to the disconnect and hindered offsite construction from taking off in the U.S. despite the proven benefits in the schedule, cost, and low risk. In the article Offsite and Modular Construction Explained, offsite delivery and early planning are dependent concepts; you just can’t have one without the other. Regarding the planning and execution of construction projects, early planning is not a strong suit. 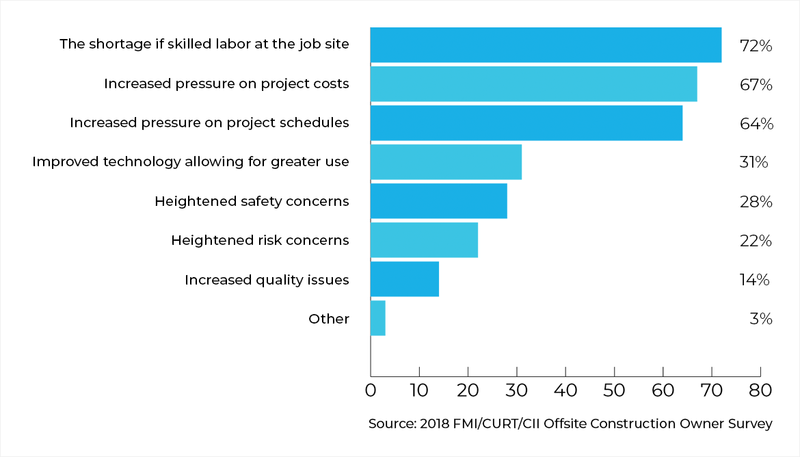 FMI’s article Rethinking Offsite Construction explains one reason for this is that project owners "don't have enough project professionals engaged in the early planning phase. It’s all business driven.” Along with that, “contracts don't allow for the early involvement of key stakeholders, such as equipment vendors, fabricators, and construction service providers, which further impedes project success." A lack of awareness of the offsite construction method is another reason why it’s not being adopted quickly. A lack of awareness can also come with a misunderstanding about the offsite techniques. In the process of starting a construction project, decisions are made at the executive level, a level unfamiliar with the execution level. “In many cases, executives don’t consider project delivery methods, construction industry pressures, drivers or bottlenecks and what it takes to effectively execute a capital project.” How can they make an informed decision, looking at all benefits, if they are unaware of the current flaws in traditional projects? What new behaviors would a new cultural approach reinforce? Which existing behaviors would be eradicated? How would our relationships with industry stakeholders change and morph? How will employees propose new ideas and/or evaluate and collaborate with one another? How will employees make light of potential problems and/or react to their colleagues’ actions? Many benefits have been found in the areas of labor, scheduling, cost, quality, and safety. When looking at prefabrication methods in the United States, the National Research Council states, "there’s countless potential for advancing the competitiveness and productivity of the domestic construction industry over the next 20 years." The U.S. had led in innovation for years and strives to find new and improved ways of production – "Offsite construction will improve productivity dramatically in the coming decades." For a realistic example, Wilmot Modular, a company that's adopted the thinking necessary to execute prefabrication and modular structures with excellence every time has delivered great success in their client's final products. After 30 years of building modular structures, Wilmot can confidently provide the telling results that modular structures work with virtually any budget. 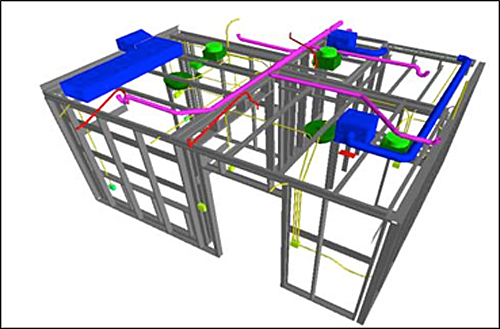 Re-usability, flexible engineering capabilities and the vast number of ideas for maximizing space usage combine to make modular buildings one of the most cost-effective and efficient types of the construction process." How can the current U.S. industry be transformed to include, and therefore benefit from, all the pro’s offsite construction provides? The three elements that need to be considered as the main pillars of strategy for every prefab project are project delivery, people, and planning. Al Schwarzkopf, associate director with Merck and Co., Inc., stated, “In order for us to have a radical change in productivity as an industry, we’ve got to revolutionize the way we deliver projects. Modularization is probably one of the key components in being able to take that first step. Offsite work requires a lot of up-front planning, which needs to be completely analyzed and prepared for during FEED. It also requires much special design and material selection considerations. You just can't take stick-built designs and cut them up into modules. You have to perform modular-based design upfront and plan the myriad of material, logistical and scope-split types of issues into the process. When starting off on the new road to offsite construction, it can be helpful to see where it's being done well already. Wilmot Modular has been in the business for 30 years, being experts at not only the philosophy and planning of offsite modular construction but also in providing excellent customer service. By providing solutions for every space need in the industry, Wilmot Modular never fails to execute the vision owners and project builders are just now getting their feet wet in. To learn more about Wilmot Modular customized structures, contact us today.